The granddaddy of the rockabilly revival returns to the north shore for this yuletide concert staple. 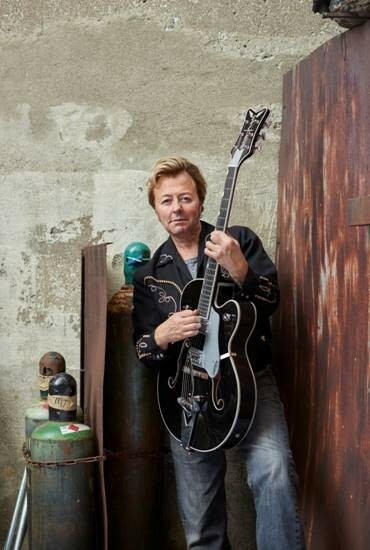 Brian Setzer and his orchestra — musical talents of the highest order — know how to throw a party. This year’s show comes on the heels of Rockin' Rudolph, Setzer's first all-new studio album of Christmas tunes in a decade. The standards are all there — “Rockin' Around the Christmas Tree,” “Here Comes Santa Claus,” “Hark! The Herald Angels Sing,” “Have Yourself a Merry Little Christmas” — each with Setzer’s own personal flair. Bring your dancing shoes — and don’t forget the Santa hat. (Eric Sandy), 8 p.m. Hard Rock Rocksino. For nearly 25 years, The Clarks have sustained a career as a better-than-average alt-rock act that’s innocuous enough for a first date. At their peak a few years back, the group could pack mid-sized venues throughout the region (and they regularly played here in town to capacity crowds at the now-shuttered Odeon). Their popularity has declined some, but the guys are still at it, as well they should be. Singer-guitarist Scott Blasey has a raspy voice that’s equally suited to country and rock, and the band often successfully mixes the two genres together. (Jeff Niesel), 8 p.m., $15. Musica. At first blush, !! !’s latest album, As If, is a hiccupy trance wrought from the past decade’s obsession with dance music. But tunes like album opener “All U Writers” are actually more stripped-down than they seem on the surface; this is dancefloor disco. From there, the album refracts that glitzy sheen across more pop rock-oriented songwriting (“Every Little Bit Counts”), 70s funk (the self-explanatory “Funk (I Got This)”) and a more contemporary indie electronic vein (“Lucy Mongoosey,” among the best tracks on this collection). It’s an album of variety, much like !! !’s fairly robust career by this point. (Sandy), 8:30 p.m., $15. Beachland Tavern. This Canadian band formed way back in 2001 but is only now getting international exposure thanks to the success of its new album, Astoria, which just came out last month. It's the first of its albums that wasn't just issued domestically in Canada. On it, the band effectively pays homage to the '80s with synth-pop melodies and high-pitched vocals. "People touch on the 80s but no one has done the Kenny Loggins and Huey Lewis stuff and we wanted to incorporate some of that — we're products of the '80s and we thought we'd take it back a little bit," says singer-guitarist Matt Webb. "We really like '80s coming of age movies like The Goonies and Back to the Future and we tried to tie some of that in." (Niesel) 8 p.m. $22.50 ADV, $25 DOS. House of Blues. Earlier this summer, Chicago-based pop-punk band, Knuckle Puck released their debut full length, Copacetic, on Rise Records. According to the official press release, “the band set out to flip the script.” “Going into it, we still wanted to be the same band we always were,” says guitarist Kevin Maida via phone from a Jacksonville tour stop. “We didn’t want to write the same 11 songs. To us, that was boring concept. We had an opportunity to impress ourselves and see how different we could make certain aspects of this while still maintaining the current band because we like the current band are. We didn’t want to pull a 180. We just wanted to do different stuff. It was fun to see how our music has changed over time.” The intro to the ballad “Ponder” features cooing harmony vocals. It’s typical of the band’s more nuanced approach on the album. Not that the band’s lost its edge. “Pretense” commences with parched, rapid-fire vocals before giving way to quieter guitar riffs. And “Untitled” pairs call-and-response vocals with noisy guitars. (Niesel), 6 p.m., $14 ADV, $16 DOS. Agora Ballroom. For more than a decade, singer Stephanie Trivison has been a familiar presence on the Cleveland music scene. With the release of Night Fires, the sophomore release from her band, These Knees, she’s finally starting to see years of hard work pay off. Its new EP represents the strongest batch of material that the group has released to date and a big step forward that reveals a tremendous amount of growth for Trivison as a songwriter and artist. (Matt Wardlaw) 9 p.m., $10. Grog Shop. It’s a testament to either the water quality in Vermont or the simple bastion of talent up there that another offbeat band of stellar musicians has emerged from the Green Mountain State to carve up the national jam circuit. Twiddle, connoisseurs of “hi-def shred,” have taken up the mantle of genre-blending live improvisation — and they’ve done so patiently, woodshedding their craft as they make their way across the U.S. The band lands in Cleveland this weekend via the Twerk Tour with headliner the Werks. It’s a good fit, as The Werks have paved much the same freeway during much the same timeframe. The Werks, hailing from Dayton and dishing up an increasing emphasis on the electronic corner of the jam band ring, have helped shepherd Twiddle, in a way, into fresh markets and eager fan bases. (Sandy) 8:30 p.m., $17 ADV, $20 DOS. Beachland Ballroom. Some 30 years ago, drummer Rick Brown began recording and performing with underground icons such as Elliott Sharp, Fred Frith, Tom Cora, God Is My Co-Pilot and many others. For his current project, 75 Dollar Bill, he's teamed up with guitarist Che Chen to play a bluesy hybrid. Opener Dan Melchior carries some serious cced: he worked in the late 1990s with avant-garage artists Billy Childish and Holly Golightly. The local support includes Chocolate Ono Band, a newly reformed project of X___X guitarist Andrew Klimeck, and DKO, a debut guitar-drums duo with Tom Orange and Stephe DK (The New Lou Reeds). (Niesel), 9 p.m. Now That's Class. In order to "recognize and celebrate those who have filled the cultural coffers of our beloved Northeast Ohio, especially with their music,” local folk singer Charlie Wiener launched an annual tribute concert a few years back. Local singer-songwriter Carlos Jones will be the fourth honoree following tributes to Alex Bevan, Pat Dailey and Michael Stanley. Local groups such as the PLUS Band, Umojah Nation, Dave Katz (from Ekoostik Hookah), Big Ship, Prayer Warriors, Colin Dussault, Alex Bevan, Robin Stone, and Outlaws I & I along with other special guests will play his music at Celebration of — A Tribute to Carlos Jones. The show serves as a benefit for Purple Heart Homes, an organization founded to provide “housing solutions to all generations of qualified Service Connected Disabled Veterans.” (Niesel), 7 p.m., $20. Beachland Ballroom. After a short run of seminal stoner rock albums in the late ‘90s and early ‘00s, Spirit Caravan faded into the ether. They reunited in 2014 (with a new drummer) for a handful of festival gigs and an earnest touring schedule. The band’s 1999 EP, Dreamwheel, mainlines all the best aspects of their music niche: desert highway guitar melodies, pulsing percussion, full-bodied vocal work, etc. After being away from the stash for so long, we can only imagine the band will be firing on all cylinders at shows like tonight’s in Cleveland, feeding fiery classics like “Sun Stoned” and “Burnin’ In” even more energy. Pack the bowl and turn the lights down low. (Sandy), 8:30 p.m., $13 ADV, $15 DOS. Grog Shop.